Crystal Palace can count themselves unlucky not to take three points from their trip to Tottenham as the hosts held on for a draw at White Hart Lane. Jason Puncheon hit the bar with the pick of numerous Palace chances. Wide men Yannick Bolasie and Wilfried Zaha were also impressive but the breakthrough proved elusive. Roberto Soldado spurned the best of Tottenham's chances but the hosts have now failed to win in five of their eight league matches at home this term. Both sides suffered defeats in midweek, Spurs dismantled by Chelsea and Palace going down at home to Aston Villa. With both eager to recover it was the hosts who fired the first warning shot as Ryan Mason's searching ball picked out Christian Eriksen, who cut inside Martin Kelly and dragged an effort wide of the near post. 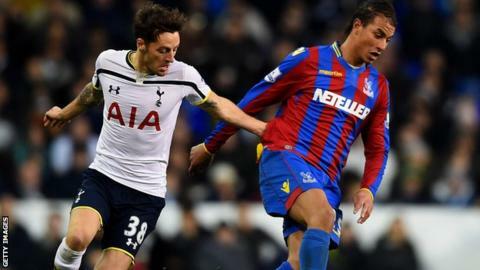 Palace, seeking a first win at White Hart Lane since 1997, lined up with five in midfield behind lone striker Marouane Chamakh. But with the direct Bolasie and Zaha running the channels with pace and invention, Neil Warnock's side were a constant threat. The visitors were on the front foot for much of the first half and a sequence of corner kicks almost culminated with Mason heading into his own net, while Bolasie's wonderful trickery to escape two markers when penned in the corner almost ended with the opener from Joe Ledley, who blazed over. Soldado, who scored the winner against Everton last weekend only to find himself on the bench against Chelsea, also cleared the bar with a presentable chance. Zaha was denied only by Jan Vertonghen's last-ditch challenge and Scott Dann forced a good save from Hugo Lloris as Palace continued to press. Gradually Spurs came into the contest, however, and twice saw Soldado go close before the interval. Harry Kane, coveted by Palace boss Neil Warnock during the summer, was having a quiet game with all the chances instead failing to Soldado, who again fired off target in the 63rd minute. Palace remained the side most likely to get the win though, and 11 minutes from the end their best chance came and went as the ball broke to substitute Puncheon after a corner but his fierce shot rattled the crossbar. Bolasie brought a good save from Lloris and Ledley fired over in what time remained as ragged Spurs held on. Palace manager Neil Warnock: "I'm lost for words. I can't understand how we've not won. The way we played, we deserved the points. The lads played some good stuff and it took a great goalkeeping performance to stop us getting the three points. "We played some good stuff, created havoc at times and always looked a threat. I don't know how many times I put my head in my hands today as I thought we'd scored that many. Wilfried and Bolaise were brilliant, but my man of the man was Chamakh - he covered every blade of grass." Spurs boss Mauricio Pochettino: "It wasn't an easy game, Palace played well. We are not very fresh because it was the third game in six days and it's difficult to manage. "Maybe this game is one where we need to get the three points, but in the end I think the result was fair. We have a lack of freshness but we tried, we tried to win the game." Match ends, Tottenham Hotspur 0, Crystal Palace 0. Second Half ends, Tottenham Hotspur 0, Crystal Palace 0. Nabil Bentaleb (Tottenham Hotspur) wins a free kick in the defensive half. Foul by Marouane Chamakh (Crystal Palace). Foul by Paulinho (Tottenham Hotspur). Attempt saved. Jason Puncheon (Crystal Palace) right footed shot from outside the box is saved in the centre of the goal. Attempt blocked. Yannick Bolasie (Crystal Palace) right footed shot from the centre of the box is blocked. Assisted by James McArthur. Christian Eriksen (Tottenham Hotspur) is shown the yellow card for a bad foul. Marouane Chamakh (Crystal Palace) wins a free kick in the defensive half. Corner, Tottenham Hotspur. Conceded by Scott Dann. Attempt blocked. Nacer Chadli (Tottenham Hotspur) right footed shot from the right side of the box is blocked. Assisted by Aaron Lennon. Offside, Crystal Palace. Joel Ward tries a through ball, but Marouane Chamakh is caught offside. Attempt missed. Nabil Bentaleb (Tottenham Hotspur) left footed shot from outside the box is high and wide to the left. Assisted by Federico Fazio with a headed pass. Attempt blocked. Paulinho (Tottenham Hotspur) right footed shot from the centre of the box is blocked. Assisted by Nacer Chadli with a headed pass. Attempt blocked. Christian Eriksen (Tottenham Hotspur) right footed shot from outside the box is blocked. Assisted by Nabil Bentaleb. Corner, Crystal Palace. Conceded by Aaron Lennon. Substitution, Tottenham Hotspur. Aaron Lennon replaces Roberto Soldado. Foul by Federico Fazio (Tottenham Hotspur). Marouane Chamakh (Crystal Palace) wins a free kick in the attacking half. Attempt missed. Joe Ledley (Crystal Palace) left footed shot from the left side of the box is just a bit too high. Assisted by Jason Puncheon. Attempt saved. Yannick Bolasie (Crystal Palace) left footed shot from the centre of the box is saved in the bottom left corner. Assisted by Jason Puncheon. Offside, Crystal Palace. James McArthur tries a through ball, but Jason Puncheon is caught offside. Attempt blocked. Jason Puncheon (Crystal Palace) left footed shot from a difficult angle on the left is blocked. Corner, Crystal Palace. Conceded by Eric Dier. Eric Dier (Tottenham Hotspur) wins a free kick in the defensive half. Corner, Crystal Palace. Conceded by Jan Vertonghen. Attempt blocked. Jason Puncheon (Crystal Palace) left footed shot from the right side of the box is blocked. Assisted by Marouane Chamakh. Attempt blocked. Jason Puncheon (Crystal Palace) right footed shot from the right side of the box is blocked. Assisted by James McArthur. Attempt missed. Yannick Bolasie (Crystal Palace) right footed shot from the left side of the box misses to the right. Assisted by Jason Puncheon. Attempt missed. Harry Kane (Tottenham Hotspur) right footed shot from outside the box is too high. Assisted by Nacer Chadli. Substitution, Tottenham Hotspur. Paulinho replaces Ryan Mason. Substitution, Crystal Palace. Jason Puncheon replaces Wilfried Zaha. Attempt missed. Roberto Soldado (Tottenham Hotspur) right footed shot from the right side of the box is close, but misses to the right. Assisted by Christian Eriksen.